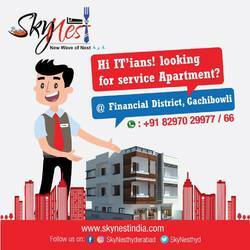 Welcome to SkyNest Service Apartments in Gachibowli Hyderabad. Daily, weekly & Monthly Rentals. Lowest and best rates in Hyderabad Quality Service “in-house”. Skynest provides AC room with Housekeeping, Wi-Fi, 24 water and Food Sincere, Well furnished, Clean Rooms and Friendly Staff members. SkyNest will assist you with Single Room/Double Sharing/Triple sharing Services Apartments with affordable price. Walkable Distance for all IT Companies Serviced Apartments in Hyderabad.